To ask “why?” shows we’re willing to accept there is a purpose behind something, and a consciousness (or person) behind that purpose. Our real, spiritual nature is to seek enjoyment. That's what everybody does. 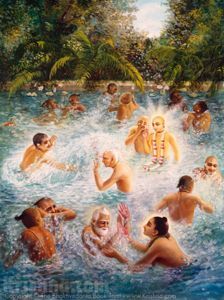 The Vedas talk about the purpose of life in great detail: Krishna is the cause of all causes, the Supreme Enjoyer, and He expands Himself unlimitedly to make unlimited enjoyable relationships possible. That's what He does. 2) the Absolute Truth-centered approach. Way #2—to act in harmony with the ultimate purpose, with reference to an ultimate creator and controller—is called bhakti-yoga—real spiritual life. This results in actual (permanent) enjoyment. Way #1 assumes "no God, no ultimate purpose," or "it's all about me," and hopes "everything will turn out the way I want." This results in hit-or-miss, short-lived "happiness" (and depression when it’s all over). This is materialistic life.